At the top of the stairs Marcelo took my arm solicitously. “Should you take the lift instead?” he asked. “We don’t want you to have an accident on the stairs, what with you having no health cover ….”. I shot a glance in his direction and he failed to hide his mischievous grin. But despite the joke, there was a worrying grain of truth in what he said. I thought I was planning ahead. I went online and booked an appointment at the INSS office in Málaga (the social security office), in mid-November 2014. My transitional health cover (paid for by the UK) was going to expire in January, and I wanted to ensure the Spanish health system had time to do the paperwork to sign me up without a gap in my health cover. That was the theory. There is a confusing range of different systems for immigrants who come to Spain. People receiving a UK pension also get state health cover in Spain, paid for by the UK government. 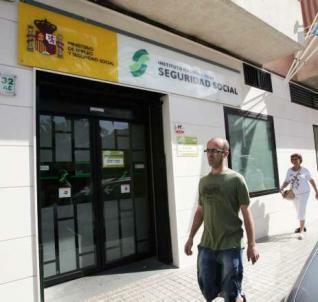 People under pension age, who are working here in Spain, pay into the social security system and are covered that way. For those of us falling between these two groups, we have the option of joining a private healthcare scheme, or going into the public system. In the UK I was a strong supporter of the state system, and my instinct here in Spain was to follow my heart and pay into the state system in Andalucía. 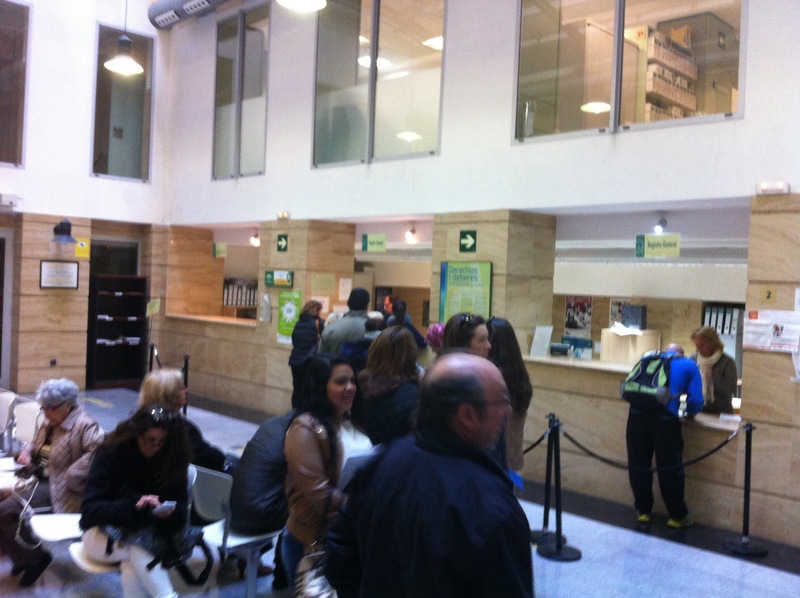 The right for immigrants to pay directly into the Spanish NHS is still quite new, and many offices don’t yet know that it exists! The INSS in Málaga denied all knowledge, until I finally got a manager to come out of a back office, and she eventually acknowledged the existence of the “Convenio Especial” but said I needed to go to the Junta de Andalucía offices in central Málaga. I’d done hours of internet research, and had read all the details of what documents I would need to take with me. Crucially, you need to have been an official resident for a full year, and bring the green residency card to prove it, along with a copy of the document showing that you have signed onto the Padrón at the local town hall. So armed with those (and copies, just in case! ), I found my way to Marcelo’s office. Only then was the precious application form finally produced (it’s available online in other regions, but Andalucía seems to like to keep its existence rather more secret). He also produced a list of all the documents required – fortunately I had brought all of them. I told him that foreigners in Spain make jokes about “la ley de falta uno” (the law that there will always be one crucial document missing), but he assured me, hand on heart, that I had brought everything necessary. He stamped it all and ticked the items off on the list, then explained that we needed to go downstairs to have it all stamped by his colleague and sent off to the Junta at Sevilla. We by-passed the queue and went straight to his colleague. Once all papers were triple-stamped, Marcelo shook my hand and said that copies of the health contract should arrive within a couple of weeks, well before my UK-funded transitional care expired. Then followed six weeks of checking the mailbox to no avail, as my “expiry date” of January 3rd crept closer. Christmas came and went, as did New Year. On January 7th an envelope with the prominent green lettering of the Junta de Andalucía appeared in my letterbox, but it felt worryingly thin, given that it was supposed to contain two copies of a thick contract. Just one thin sheet of paper came out of the envelope. “Your application is missing one document ….”. The law of “falta uno” had come into play again. Although I had already provided the S1 document which showed that my UK cover expired on January 3rd, they needed another letter from the Department of Work and Pensions Overseas Health Department to confirm it had expired, and that I had no further rights to cover from the UK. I phoned the DWP in Newcastle, and they couldn’t have been more helpful. The letter arrived within a few days, and clutching a few spare copies of it I went back to see Marcelo. He stamped the document, and added the name of it to his list, to help future applicants. As we left his office to go downstairs for the second set of stamps he teased me about being between the two health systems, and advised me not to go skiing in the Sierra Nevada that weekend. The rest of January passed, and I avoided skiing without much difficulty. February also came and went, and nothing arrived in my letter-box. I went back to see Marcelo again. When he saw me, his face fell. “Still nothing?” he asked, with genuine surprise. He phoned Sevilla and sounded rather firm. At one point I heard him emphasise that I had first applied back in November and that “we are leaving this woman without access to healthcare which is unacceptable!” he said. Putting down the phone, he promised the documents would arrive soon. And finally, they did. Two copies of a ten-page Convenio Especial (special agreement), a contract between the Junta de Andalucía and me. I signed both copies, and sent them back along with a bank receipt for the first month’s payment of 60€. And the nervous daily checking of the mailbox began all over again. Mid-March, four months after my first visit to fill in the forms, and the mailbox clattered again. 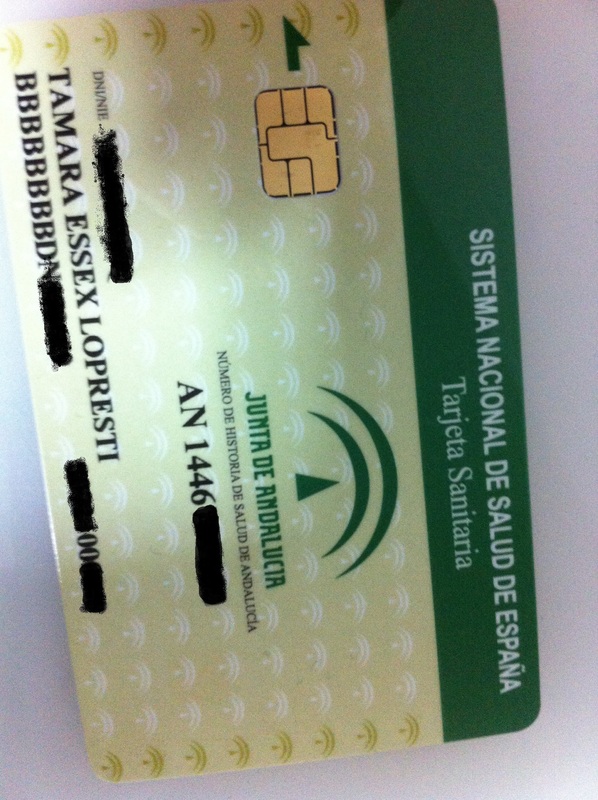 My Spanish health card arrived, and at last I am back in the safe arms of a state National Health System. And it feels very good. 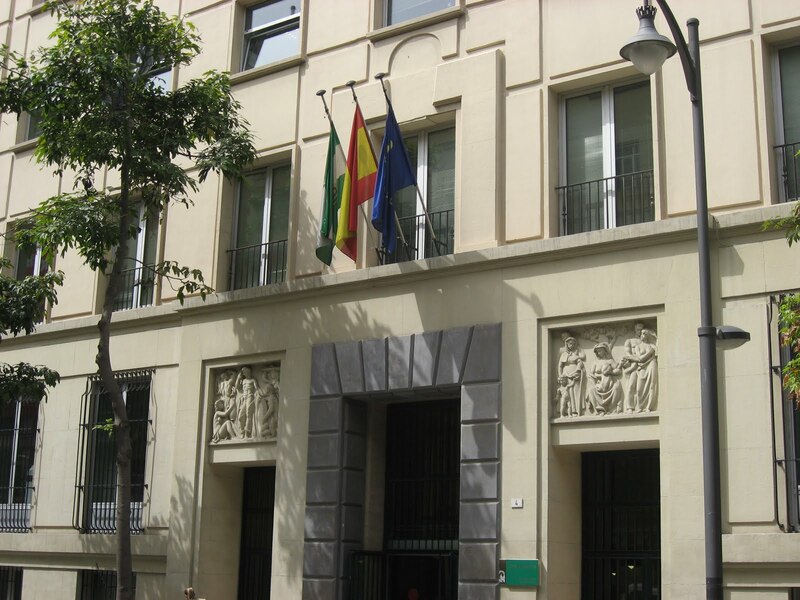 The Real Academia Española is the great guiding light that guards the Spanish language, and tries to accept or reject changes and developments to it. Above all, it seeks to be the arbiter of truth and perfection in all things relating to the language. The trouble is, sometimes it makes very silly decisions. In its list of revisions in 2013 it announced that the tilde was no longer required on the word “sólo” when it means “only”. The tilde had been used to differentiate the word from “solo” which means “alone”. The Real Academia has now said that the tilde may be used. Sometimes, clarity is everything. This entry was posted in Spain and tagged Andalucia, expats, immigrants, learning Spanish, Málaga, residency, Spain by tamaraessex. Bookmark the permalink. Did you mean solo to have tilde “~” or an acute accent “´”? All the accents (ie the acute accent and the ñ accent) are called tildes in Spanish. Thank you for your interesting and informative blog. We have recently returned home to Canada after spending a week in Colmenar with our neice (Karen) and her daughter (Isis). Thanks to your blog we were able to plan our short vacation and visit many of the highlights around Malaga. I will continue enjoy your stories and one day we may return to Spain to continue our adventures.